Sabs from Three Counties Hunt Saboteurs and North Shropshire Hunt Sabs have just been escorted out of the Builth Wells Hound Show in Wales having stormed the ring in protest at the hunting of wildlife which continues across the UK. It is one of the 5 main hound shows listed on the MFHA website for this year. Sabs were recognised by members of hunts which we regularly attend, but they were too slow to stop them from getting into the ring, taking Tim Bonner and the judges by surprise before being escorted out (having offered to help judge the show themselves). Do you have information you want to share? Call us today! With the recent expose of the South Herefordshire Hunt going public yesterday (see our article) we’ve already received more information from a variety of different people concerning hunting / terrierwork and other ‘sports’ such as badger baiting, the killing of birds of prey and so on. At Three Counties Sabs we’ve always respected the confidentiality of those who have called in or messaged us with information, anonymously or otherwise, and will continue to do so regardless of who you are. Pro-hunt but appalled at activities such as those appearing in the recent video? Secretly anti-hunt within a pro-hunt community? Overheard something in a pub one night? Or just recognise someone in one of our photos or videos? Contact us anytime of the day or night with information, however small you think it may be. We do not judge anyone who gets in touch and try to support those who are or have been victims of domestic abuse in communities other than just our own as we are aware that violence in the home / relationships is widespread and affects many people – those with the phones are women and will talk to anyone with respect and patience. In light of recent information being released about the activities of South Herefordshire Hunt staff, we’ve put together the following article. We’ve had the pleasure this last season of working very closely with the fantastic North Shropshire Sabs for about 10 of the hunt’s meets this season – thank you to North Shrops for helping us focus a lot more attention on them. In recent weeks hunt staff have been arrested on suspicion of animal cruelty. Footage appears to show fox cubs being kept in a cage at the kennels and taken into where the hounds are kept before being brought back out dead and thrown into a bin. During these last two hunting seasons we’ve been building up a picture of a number of hunts in the three counties which we have previously spent less time with, as well as increasing our knowledge of hunts we regularly sab and monitor. For example, building on information gained during the badger culls in Gloucestershire, we’ve put a lot of energy into checking badger setts and gathering intelligence on hunts blocking setts to prevent foxes from seeking shelter in them on hunting days. We’ve spent more time over the last two years looking at the Ross Harriers and the South Herefordshire hunts and trying to find out more about them. Both hunts have blatantly hunted foxes (and hares, in the case of the Harriers) in front of sabs and have not been too hesitant in trying to start physical confrontations. Two seasons back the Harriers, with Lee Peters as huntsman and master, repeatedly tried to provoke sabs into fights on different occasions and we caught them marking to ground at a number of badger setts. Towards the start of 2015 when a couple of sabs turned up at a meet, the South Herefordshire Hunt terriermen assaulted one sab when she believed a dig-out was in progress after hounds had marked to ground in an area. Huntsman at the time, Mal Williams, to his credit on that day specifically, intervened to stop the assault from escalating and the police were informed about the incident. Whilst the huntsman has since changed (Paul Oliver Esq. has now taken on the role from Mal) and one of the men involved in the assault (pictured masked up in the assault pictures and unmasked on his own above) is now a terriermen for the Ledbury Hunt, the attitudes of the hunt and their terriermen do not seem to have changed much, the illegal activities we suspect that they were involved in are suspected to have continued. 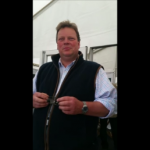 Supporter and terrierman Paul Standen (also connected to the Ross Harriers, in particular their ex-huntsman Lee Peters and ex-terriermen) was convicted in 2012 of assaulting a sab and was recently cleared of assaulting another sab during a separate incident. He can be seen in this video (watch this space – back online soon) pointing out to the hunt where a fox has run, along with Jack Gwillam, who is known for throwing engine oil over the windscreen of a 3C vehicle whilst we were driving along at the end of March 2014 while out with the Harriers. This recent exposé of the hunt was released publicly on 23rd June 2016 by the independent group theHunt Investigation Team. The news had picked up on the situation a couple of weeks earlier, but details had not been released then. Unfortunately it hasn’t come as a massive surprise to find out that this was what the hunt are up to. The Ross Harriers terriermen convicted of having a live fox in a bag during 2015 were once terriermen for the South Herefordshire before moving on to the Harriers. It is strongly believed that such incidents are not exclusive to the Harriers and that the men involved were not new to such activities. We also suspected that the South were using bagged foxes (foxes caught or kept for releasing to the hounds on a hunt) based on their behaviour at a couple of meets during the season, including this one when they held a joint meet with the Crawley and Horsham Hunt in December 2015. On this day, 3C sabs had split into 2 separate groups. Bristol, Bath and South Wales sabs had come over from a cancelled meet of the Ross Harriers to help us out and we were keeping an eye on various groups of hunt supporters, the hunt itself and the terriermen. The 3C driver radio’d through to a team on foot that she suspected the terriermen were up to no good as they had clearly asked hunt supporters in a vehicle to slow down the sab car on the road. At this point, the foot team watched as the other quadbike sped off from the back of the field (the riders out with the hunt), scaring some of the horses as they did so. The sabs ran to catch up as best as they could. As they came into sight of the hunt a couple of minutes later, a repeated whistle could be heard (whistles have been used for many years in place of the traditional ‘holloa’ at some hunts to indicate that a fox has run in that direction – whistles are often used instead of holloas as hounds will not react to them and lift their heads – it is a way of communicating with the hunt staff without distracting the hounds themselves). In addition to the suspected use of bagged foxes and the more recent information which has come to light, we also suspect that the hunt have blocked badger setts in the areas in which they hunt. Hounds marked to ground at a partially-blocked badger sett on New Year’s Day 2015, ex-master Patrick Darling (whose land this incident took place on) proceeding to push the 3 sabs downhill after the hunt had to call hounds back. On 14th March 2015 sabs attended Mal William’s last meet with the hunt at the Black Swan (see list below for more of the hunt meet venues and their contact details). With sabs coming over from the South Wales, Bristol, Bath and Southampton groups, the hunt did a quick disappearing act into one of their favourite haunts, the Mynde Estate. Throughout the day hounds were called off foxes (and deer) before hunt supporters blocked in some sabs and punched one of them in the face. A fox, frozen solid, was then discovered on a grit bin nearby, bite marks clearly visible on his body – he’d been put in a freezer by someone then left for us to find. We wonder what the Masters of Fox Hounds Association will say about this – the first of their 3 ‘Golden Rules’ for anyone going hunting (in their Code of Conduct) is that foxhunting is the hunting of a wild animal in its wild and natural state and nothing must be done which compromises this concept. Rule 3 of 3 is that the masters of hounds (or appointed deputies) are solely responsible for the conduct of each day’s hunting – wonder if they’ll extend that to include the conduct of the hunt at kennels too. The Veterinary Association for Wildlife Management agrees with foxhunting as a means of managing populations and states that foxes are hunted in territory which they are familiar with, thereby giving them the best chance of escape. The use of bagged foxes and the feeding of foxes directly to hounds surely does not fit in with this statement. Some of the venues which the hunt hold their meets at during the hunting season are listed below. If you contact them about their support for the hunt, please keep all communications polite. While the following articles do not refer to the South Herefordshire itself, they highlight the fact that incidents such as those shown in the recent expose, as well as the use of bagged foxes, have been going on for many years (and do not seem to have ceased despite the Hunting Act coming into force in early 2005). More information about the use of bagged foxes can be read in this article from the League Against Cruel Sports in April 2004 when they investigated the Croome and West Warwickshire Foxhounds who hunt in the 3C area. Even hunt staff and supporters themselves write about badger setts and badgers in relation to hunting – our article Hunts vs Badgers covers a number of different examples, as well as mentioning our own personal experience with hunts mainly in this last season when we’ve started to focus more on the link between badgers and hunting. If you can help to support our continuing work against the hunts in the three counties, gathering evidence against them and intervening when possible to stop wildlife persecution, there are a number of ways you can get involved. We headed to the Three Counties Showground today for a little demo alongside Worcester Vegans & Veggies. We had the usual clever comments, usually spoken quickly just before scuttling across the road away from us, like ‘freak’ and ‘obnoxious scumbags’ as well as the odd mature argument like putting a middle finger up at us which is always amusing. We also had a number of anti-cull and anti-hunt people coming up to us to have a quick chat as well as being interviewed for Midlands Today, although we didn’t appear on the show in the end. 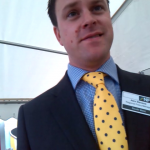 Inside the fair, we spoke to Matthew Price at the NFU stand (briefly as he apparently didn’t want to stick around long) who is also associated with the South Herefordshire Hunt. 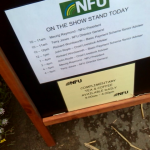 He was having a chat with farmer David Barton, who stuck around for a somewhat more mature discussion about tuberculosis and the badger cull and we also got to meet Alex Stevens who is the NFU Regional Policy Manager for the South West. It was a really good chat, thanks Alex for not running away from us too! On top of this we got to meet the North Ledbury hounds and the Severn Vale beagles and well as being stared out of the ‘Herefordshire hunts’ exhibition by some local hunt supporters. The hound parade was a little mediocre to be honest… apparently young boys don’t want to get involved in hunting once they get to that age when pretty young girls are more interesting to look at! It was like watching 2 awkward older men talk awkwardly to each other for 10 minutes. Probably because that was what it was. But with microphones.